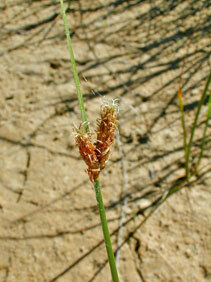 Also Called: American three-square, chairmaker's rush, american bulrush, three-square bulrush, basket grass. Culms: Erect to strongly arched, sharply triangular, stout, up to 1/4 inch wide. Leaves: Blades 2-4, linear, flat to slightly rounded near base, up to 8 inches long, less than 1/6 inch wide, occur on lower 1/3 of culm. Inflorescences: Lateral clusters of 1-8 sessile spikelets; involucral bract slender, up to 6 inches long, appears as continuation of culm, tip pointed. Spikelets: Egg-shaped or cylindrical, 1/5 to 4/5 inch long, many-flowered, tip nearly pointed; scales egg-shaped, yellowish to reddish-brown, 2-cleft at apex, midrib prominent, extending as short point or awn. Fruits: Achene, egg-shaped, 2-sided, up to 1/8 inch long, pale brown to olive, short flexible point at tip; subtended by 4-6 bristles that rarely exceed achene. Habitat: Marshes, pond and lake edges, and other wet areas; usually found in standing water but can withstand periods of drought; fine silty clay loam to sandy loam soils. Uses: Native Americans used three-square for basket-weaving. The Paiute would make flour from the seeds. The seeds are a food source for wetland birds. Three-square is sometimes planted to control erosion and for wildlife food and cover.